This is the same area of Washoe Lake State Park, where in April 2015 Gov. Brian Sandoval talked about the drought and its impacts on Northern Nevada. This photo was taken on Thursday, March 23, 2017. CARSON CITY, Nev. — Washoe Lake, which was dry just a few months ago, is now full to the brim. That brings a big smile to Jennifer Dawson’s face. She’s the Washoe Lake State Park supervisor who’s now looking forward to a full summer of aquatic recreation. But for Charlie Wolf and Matt Nussbaumer of the Nevada Department of Transportation, the lake level is worrisome at best. “We went from nothing to everything in a couple of months,” said Dawson. And “everything” in this case means the water is approaching the west-side shoulder of U.S. 395/I-580 just north of Bellevue Bridge. Washoe Lake is fed by 11 different streams: eight on the west side and three on the east. All those streams already have more water flowing downhill than anytime since 1997, the last time the lake nearly overflowed the freeway. 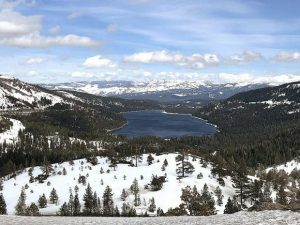 According to weather experts, due to this winter’s large snowpack at Lake Tahoe, there’s still eight feet of water in the snow on the east slope of the Sierra overlooking Washoe Lake. And all that water has to come down the hill during the approaching spring runoff. At the same time, the only outlet from the lake — which less than 2 years ago became completely dry due to the Western drought — is Steamboat Creek at the northwest corner of Little Washoe. At NDOT’s request, managers of the Washoe Lake and Galena Creek Ditch Company opened the gates a couple of weeks ago. Chief Deputy Federal Water Master Dave Wathen said since the gates to Steamboat Creek opened, the lake level has stabilized. “Right now, there’s about 60 cubic feet per second through that gate and over the top,” he said. For Dawson, seeing the lake at its full three-plus miles long and two miles wide is a wonderful site. She said area residents are already turning out to enjoy the water. “Two weeks ago we had our first water skier,” she said. At the one open campsite, she said all of the sites were occupied. “In mid-March to have 27 sites occupied, that’s pretty unreal,” she said. The sandy spot of lake bottom where Gov. Brian Sandoval held a press conference to declare war on the drought in April 2015 is now 30 yards from shore. Once Dawson and her crew finish rescuing picnic tables and barbecues from the water, clearing the grass and other muck from the boat ramps and beaches, cleaning and repairing the trails around the lake and making sure the necessary amenities including restrooms are all in operation, she said she is expecting a banner year for tourism at the park. At the south end, a metal picnic table sits a dozen feet from shore nearly covered with water. “This was a nice sandy beach,” she said. Pointing to a grill sticking up out of three feet of water at Little Washoe, she said they have a lot of clean up to do. The whole area, Dawson said, has a lot of drying out to do. That includes Minor Mayhem, the children’s maze at the campground area on the east side that, this past week, was still a mud bog. And the trail up Deadman’s Creek to the gazebo atop the hill, she said, “got washed out.” But she said she has a Boy Scout Troop willing to help make the repairs this spring. “Last summer with no water, camping was up 43 percent,” she said crediting a series of creative programs including hikes, stargazing, equestrian and other activities. Now, she said, aquatic activities are back as well. That also will help the park’s bottom line since much of their operating revenue comes from camping and other fees. Those activities include fishing but Chris Healy of the Nevada Department of Wildlife said anglers shouldn’t expect too much too quickly. He said even after wildlife seeds 2,500 catfish into the lake in June, it will take fish populations more than a year to recover. Healy said Wildlife doesn’t have the cash to buy warm water fish for Washoe Lake and trout would just die as the water temperatures increase this summer. 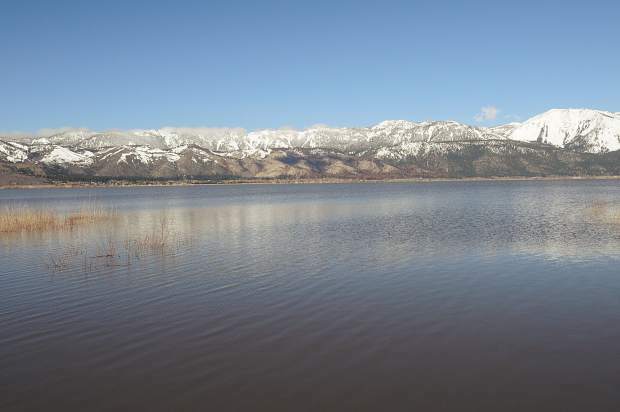 But he said the department’s biologists say Sacramento perch, white bass and carp survived the drought in Little Washoe at the valley’s north end and, now that the two bodies of water are connected again, will migrate back into the big lake. For NDOT, the question is whether Steamboat Creek can handle the volume of water it must to keep the freeway connecting Reno and Carson City above water. Wathen of the water master’s office said it always has in the past and appears to be doing so now. Dawson said she’s also working with NDOT to possibly increase the amount of water that can be stored in the wetlands at the lake’s south end — in normal years a protected breeding area for waterfowl. Not only should the birds be back this year, she said storing more water there should help control the lake level as well. Adam Sullivan, chief of the hydrology section of the Nevada Division of Water Resources, said the problem with Steamboat Creek is likely to happen all the way north where it runs into the Truckee River near the Reno-Sparks Water Treatment plant. At this point, Wolf and Nussbaumer say they’re confident the water won’t overtop the freeway. Nussbaumer said, however, the more water goes down the creek, the more likely downstream problems will happen. He said they already received a call from Granite Construction asking to reduce the flows a bit because of their construction along the southeast connector. The water officials said the water in January 1997 came to within a foot of the road’s elevation but, based on the latest projections, they believe they’ll have two feet of elevation to spare this year. 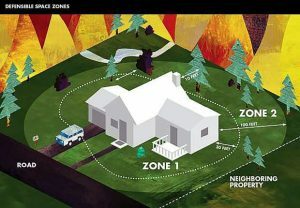 Wolf said, however, that could change with a warmer than average spring, early snowmelt and another rain storm or two. There also is more work for crews keeping the culverts under the freeway that pass those stream flows through to the lake cleaned out — in part caused by more sediment coming down the mountain in the wake of the Little Valley fire. If the water level rises more, they may do what was done in 1997 when material was placed along the lake’s edge near Bellevue Bridge to counteract wind and wave erosion along the road’s shoulders. Geoff Dornan is a reporter with the Nevada Appeal, a sister newspaper of the Sierra Sun’s and North LAke Tahoe Bonanza’s based in Carson City.